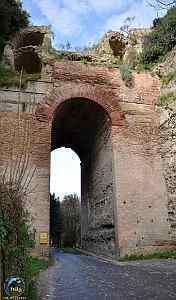 These are entries in Naples: Life, Death & Miracles dealing with ancient Naples, Rome, Greece in Italy (Magna Grecia), the Goths, Lucania, ancient peoples of Italy, Etruria, and pre-historic times; that is, everything before the fall of the Roman Empire in 475 AD. Baia bridge destroyed by storm! Pompeii/Vesuvius eruption - wrong date!